Work independently but not on your own at My Office & More where there’s a professional shared work environment along with a dynamic community. 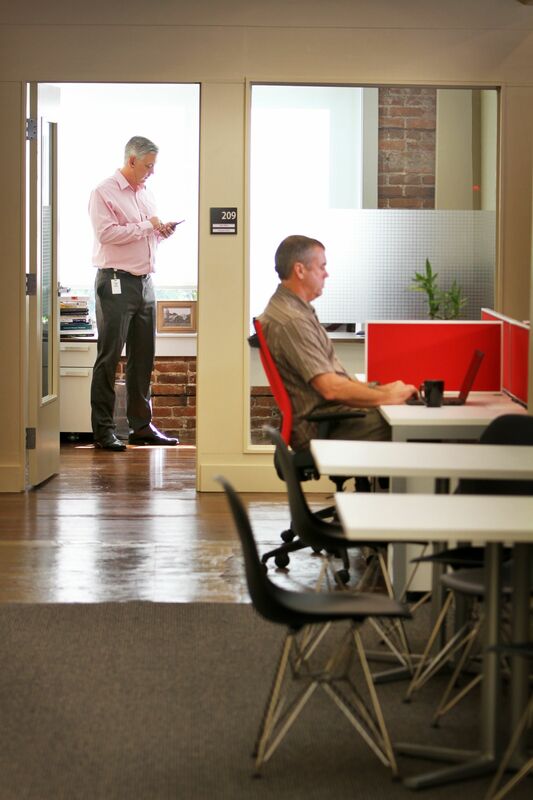 My Office & More offers both furnished private offices and collaborative spaces. Located in downtown Lakeland in a historic building next to Munn Park, you will find a superb interior with exposed brick walls, wood flooring, and a skylight near the communal area that allows natural light to fill up the space. 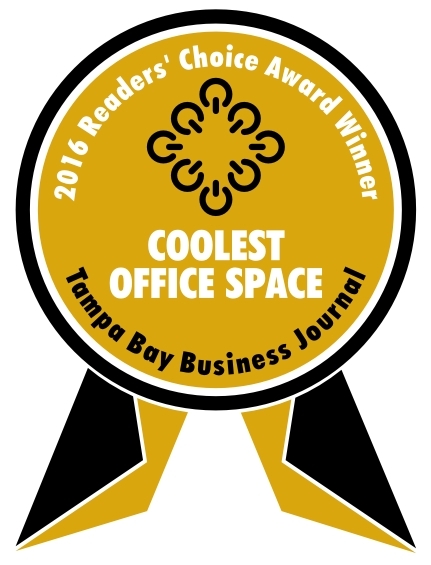 It's such a great environment that it won the Tampa Bay Business Journal's 2016 Readers' Choice Award for the Coolest Office Space! The inspiring facilities include 24/7 access, mailboxes, high-speed internet, professional meeting rooms, business-class multi-function copier/printer, postage machine, Samsung 4k Smart TVs, Herman Miller furniture, free coffee to Members in the morning, vending machines, and invites to Member events. Come work for an hour, a day, a month, or a year! Whatever your business needs are, My Office & More is there to help you. An environment where connecting with the business community comes naturally and individual work focus increases productivity. 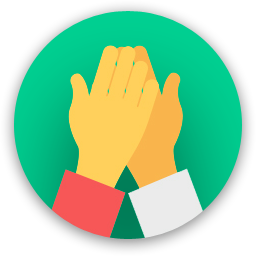 Collaborate by exchanging innovative ideas and solutions while discovering ways to improve professionally. Are you a member of My Office & More? My Office & More provided not only the most uniquely designed and comfortable workspace for my growing business when I needed it but the energy of the other businesses that co-habited and collaborated with us was one of a kind. The staff is beyond professional and have a heart for service! Thanks guys!! Bridgette - THANK YOU! Everyone loves collaborating with you too! You bring light and energy to everything you do. "The Right Space at the Right Location!" You can't believe the passion that the My Office & More team has to help ensure your business is a success. The space is creative and dynamic. The staff is helpful. The location is P-E-R-F-E-C-T! Check them out! Thanks Grant! We appreciate you! "An Environment That Inspires Creativity & Efficiency "
From the moment I stepped off the elevator leading into the 2nd floor, I knew I was going to never want to leave! The detail behind the layout of the space is second to none - private offices, co-working desk area, the kitchen, and the conference room. The white/pink noise in the conference rooms and throughout the entire space truly allows for concentration and and a relaxed work environment. Comfy chairs and amazing technology fill the space. This space is something you would see in a movie or perhaps in one of our country's major urban cities! The location is surreal – view of beautiful Munn Park, tons of local dining options, and plenty of spots for after hours celebrations. Kate Lake has truly created a space that inspires creativity and efficiency; it's no wonder why my agency chooses My Office & More as the venue for planning/team building. 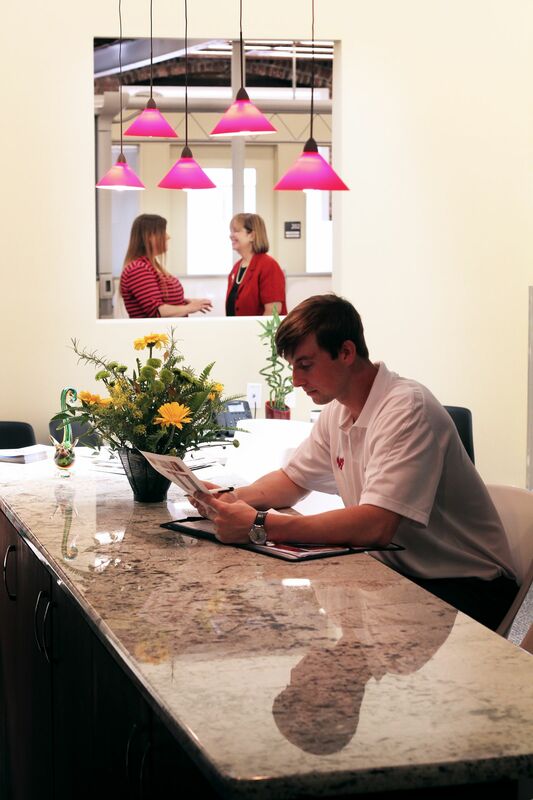 "Comfortable, Clean, and Peaceful Atmosphere "
I love working at and visiting My Office & More. It is the atmosphere and cleanliness of the space. The amenities are great and convenient for both PC and Macs. There are a variety of great spaces to rent. Thank you, Jared! We love having you here!! "My Office & More is AWESOME! " We use My Office & More for our team days for Maximize Digital Media. The building's space is luxurious and has been set up to feel like home. Every single time we come in we are greeted with a warm welcome by a smiling Kate Lake and we can't help but smile back! She has all of the amenities we need (a huge conference room equipped with a projector, whiteboards, comfortable and plentiful seating, and she even arranges to provide some coffee to our caffeine-needing employees). Simply put, this is a place I wouldn't mind working out of every day. And Austin, we think YOU are awesome! Every time we see you, WE have to smile! Thanks for the review. "Ideal Space for Team Building "
We reserved the conference room and media room for Maximize Team day ok two occasions! I am not sure I have all of the words to describe it. Powerful, accessible, connected... Those are just the beginning. Becsuse of My Office & More, my team at Maximize was able to spend the day Maximizing because they provided the perfect space for it! We had team building and knowledge sharing, in an environment that was conducive to creativity and inspiration. My Office & More has a lot more to offer than just an office space! Thank you Kate and your team for taking such great care of us! We're looking forward to our next Max Team Day! Chrissanne, thank you so much for taking the time to write a review. We love the synergy of working with Maximize Digital Media. When you are here, the positive energy goes off the charts! 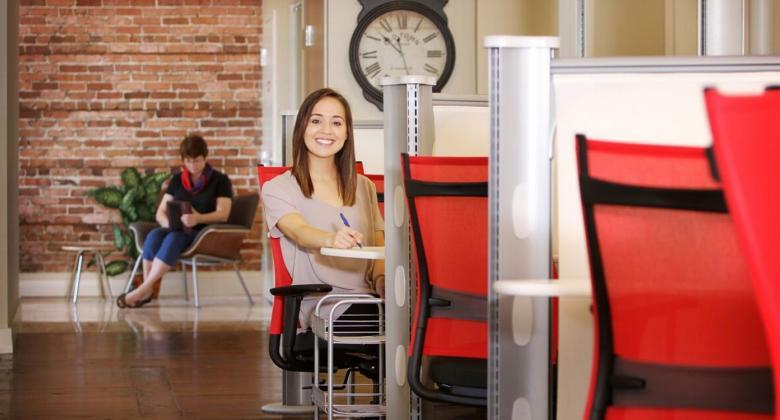 My Office and More is perfectly situated in Downtown Lakeland. My office has used the facility multiple times for team building days and we have found it to be not only welcoming but innovative. On-call, Kate provided electrical equipment (chargers, HD cords, etc) while also helping assist us as a host with a warm smile and encouraging chatter. What I find most useful is the variety of working spaces — both open, private, and conference to choose from. 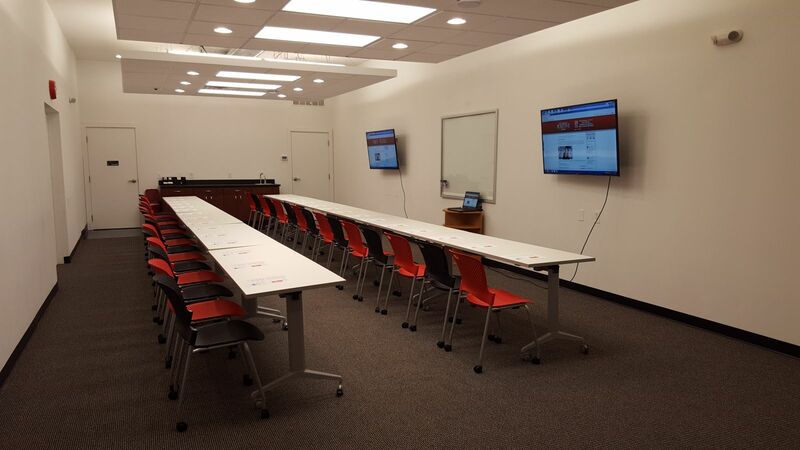 Our team benefited from dividing up and using two different conference rooms for two different departments — the media room was especially cozy and provided the connection we needed for presentations. Overall, our experience was great! We will be returning and using this space for all of our team needs. Thank you, Jasmine! You are such a joy to be around that we get very excited anytime you are in the house! Can't wait to see you again! "You really must this to believe it! A fantastic choice for my office and probably yours too!" 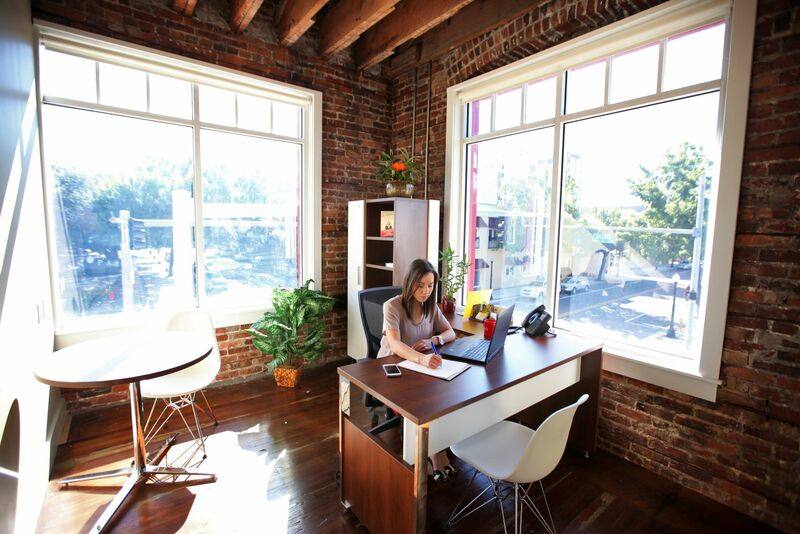 My Office & More is housed in a 100 year old building in the heart of downtown Lakeland, Florida with gorgeous views of Munn Park and within a short walking distance to dozens of restaurants, coffee bistros and locally owned shops. The original old brick walls, stripped down wood floors and open rough-cut beam ceilings are happily married to beautifully classy, comfortable, contemporary furnishings. 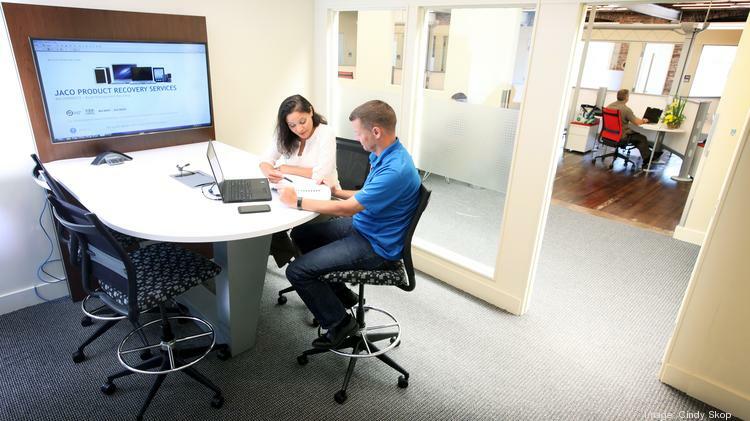 The ambiance is more reminiscent of an uptown big-city loft than an office setting in a small Central Florida town. 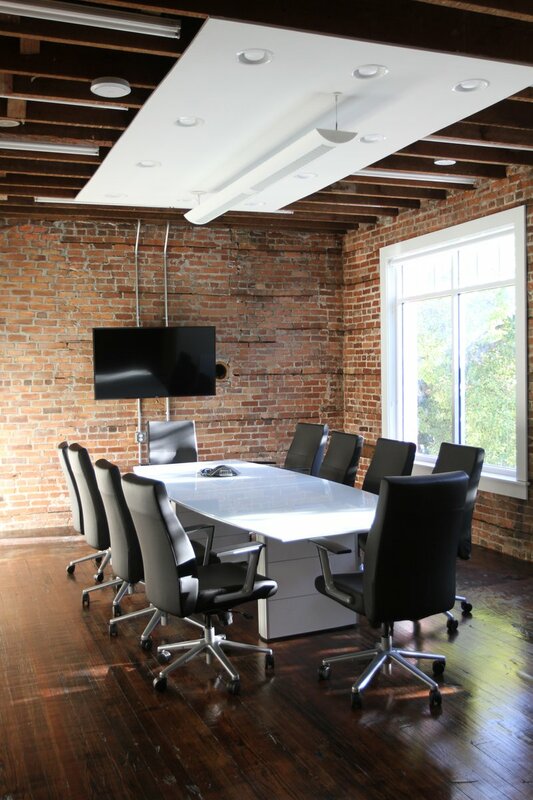 Natural light floods the second floor offices, conference room and desk spaces providing a friendly environment for the professionals who occupy the space to enjoy collaborating and building business relationships. 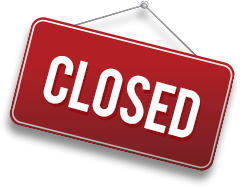 Options from private offices, to reserved desks, to virtual offices, to the day-pass are offered. I have been here for the entire year since opening and will soon sign on for another year. I absolutely love being at My Office & More! Come take a tour! Jan, thank you so much for your review! We so enjoy having you in our community. 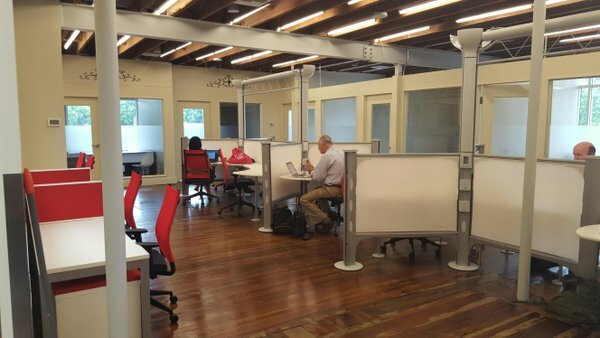 "Absolutely the best office space in the entire area! Voted the best for multiple reasons." I love my Reserved Desk at My Office & More. Classy, yet comfortable contemporary furnishings in a gorgeous 100 year old downtown building that just exudes character! Big city feel in a friendly small town! A most pleasant place to work and to network. My business is growing and expanding as a result of the collaboration I enjoy with diverse business co-workers here. Walk just downstairs for a killer Dominican lunch! Also, grab your wifi in Munn Park downstairs for your calls! Definitely consider catering a lunch from one of the many amazing dining options: Posto 9, Fresco's, Palace Pizza, Divicious, Harry's. I recommend the cold brew coffee at Black and Brew which is across the street and Posto 9 for lunch. A bunch of little coffee shops and restaurants close by. There's coffee, snacks and conversation in the common area. Parking is across the street on Munn Park — 1$ = 1 hour. Two great sandwich shops are located in the building and other great restaurants nearby. A walk in charming Munn Park is just across the street. In the center of downtown with dozens of restaurants and bistros within short walking distance and two great sandwich shops in the same building. Beautiful center-of-town park right across the street....great view! My Office & More too? My Office & More will be in touch with you soon to confirm. My Office & More has received your membership enquiry and will be in touch with you soon.